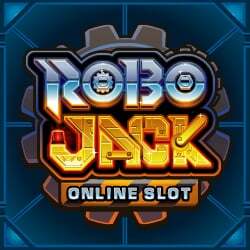 Power up for some futuristic fun with this 5 x 3, 243 Way game, RoboJack, crammed full of electric Free Spin features! 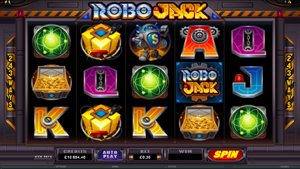 RoboJack and his metal-clad mates guide you through the bold Base Game, featuring 4 High symbols, 4 Low symbols, a Wild symbol to boost winnings, and a state-of-the-art Scatter symbol! 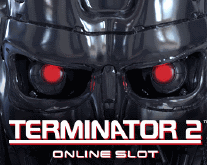 When 3, 4 or 5 of these Scatter symbols land on the Reels, the game kicks into overdrive! You are presented with 5 Robots, each with its own Free Spin feature. A Robot will randomly award from the 5 presented, and you may either accept the rewarded feature, or try once again for a different Robot's Free Spin feature. 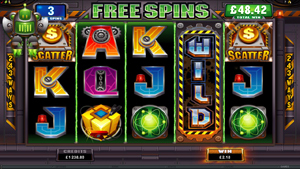 The riveting Free Spin feature options include Extra Wilds, Wild Reels, up to 65 retriggerable Free Spins, Scatter prizes and Win Multipliers, so the only difficulty you will have with this geared-up game is choosing your favourite Robot!